Today's blog post is about some great deals I found today at Walgreens.Yup, Walgreens is just about the only thing open on Christmas Day here in Williamsville, New York. I found some wonderful nail polish deals (that was inevitable as I can't seem to stay away from those laquer filled aisles) and makeup. Specifically, some very pretty lipsticks and at a BARGAIN!! Ok so, I'm not all uppity or sophisticated when it comes to lipsticks or lip glosses. I don't wear them real often and I don't think paying top dollar for them is sensible, at least in my case. For all you lipstick connoisseurs out there, if YOU feel this is SMH worthy, please do comment below on why I should think otherwise. Would love a different perspective on this matter. I will apply again and test the longevity of wearing it a few hours. I'll keep you updated on that. 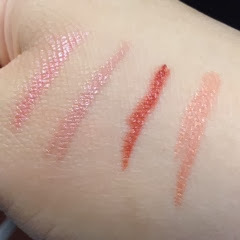 Swatches of the 4 colors I PURCHASED at just over $1 EACH!!! 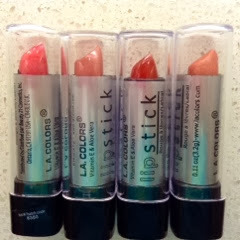 All LA Colors lipsticks that I bought at a STEAL, from Walgreens. 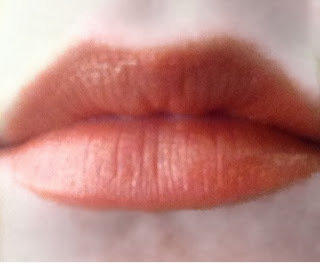 Hope you enjoy this post and the lipstick swatches. The nail polish and supplies I bought today will be blogged about very soon. Keep in touch with comments and share your experiences with me please as I share mine with you all. May your Christmas be blessed and May Jesus be the reason for your season.